Making the “Local Heroes” column of the Trib was a big deal to Chicago bands at a time when amazing acts like Urge Overkill, Smashing Pumpkins, Material Issue and Liz Phair were breaking out of the Windy City. The main photo here was by Patsy Desmond and was shot in the kitchen of Art and Martha Kubin. The solo shots on the right were taken in the apartment on Belmont that Ken shared with Paul Caporino, the songwriter behind M.O.T.O. 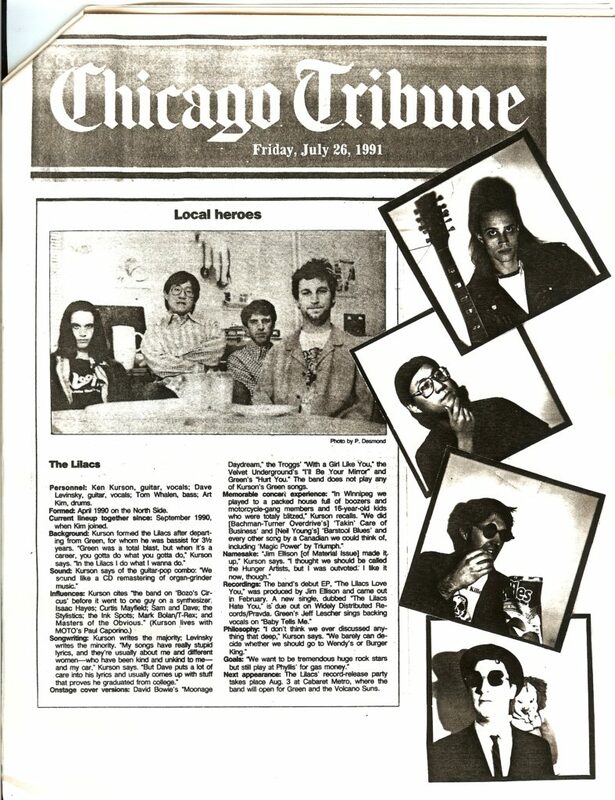 The Lilacs featured in the Chicago Tribune’s “Local Heroes” column on Friday, July 26, 1991.